Free system cleaner software to clean up Windows and boost performance. 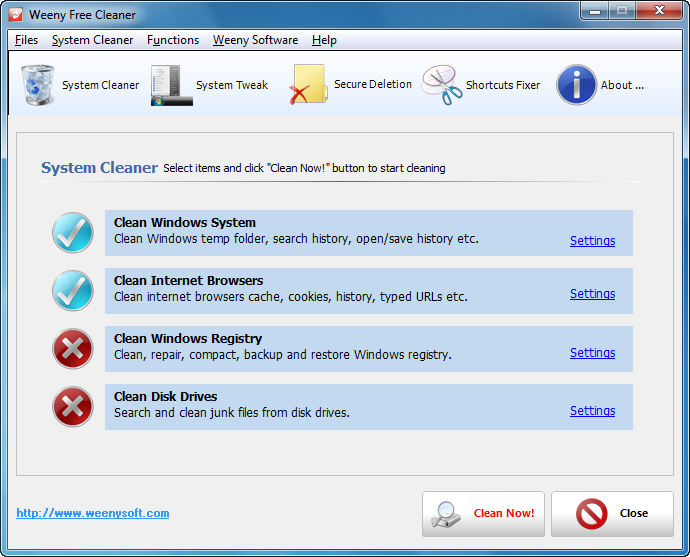 Free System Cleaner is an all-in-one free system cleaning software to clean up Windows system, boost performance and prevent registry corruption. With simply one click, Free System Cleaner allows you to delete Windows temp folder, search history, run history, open/save history, recent documents, your internet browser's cache, cookies, history, typed URLs, and much more. Free System Cleaner's powerful plugins manager makes it easy to delete the tracks of third-party applications, such as search history of Google Toolbar, playlist of Real Player or recent used files of Microsoft Office etc. Free System Cleaner allows you to safely clean, repair, backup and compact Windows registry with easy. You can also use Free System Cleaner to delete files or folders completely to prevent them from being recovered. Free System Cleaner works on Windows XP, Windows Vista, Windows 7 and Windows 10, both 32-bit and 64-bit versions. The software name is changed from Weeny Free System Cleaner to Weeny Free Cleaner due to "System Cleaner" trademark conflict. Click the download button above to download Free Cleaner full version. Full version means the file is complete and comes with all the media needed to install and manage this software. Full version also means Free Cleaner software doesn't have any watermark, nag screen, time expiration or function limitations. Easy to use - One click to finish cleaning Windows system, internet browsers and Windows registry. Free to use - 100% free to download, install and use, no limitations, no extra fee. Clean tracks - Clean all kinds of tracks on your computer. Clean registry - Safely clean, repair, backup and compact Windows registry. Security delete files - Completely overwrite files with random characters making them unrecoverable by file recovery software. Protect privacy - Clean your online and offline tracks to protect your privacy. Boost performance - Delete unneeded files to recover hard disk space and speed up system performance. Custom items - Simply click and assign your personal set of files, drivers, or registry entries for cleaning. Automatic cleaning - Schedule automatic cleaning cycles at specified intervals, during start-up or shut-down. Plugins manager - Erase the tracks of third-party applications, such as playlist of media player, recent used files of Microsoft Office, search history of Google Toolbar etc. System tweaking - Change many Windows settings that are normally difficult or impossible to access. Cookie keeper - Save valuable cookies to maintain your preferred internet settings and log-ins. Weeny Free Cleaner is yet another windows cleaning and tweaking tool. It has an easy to use tabbed interface that helps cleaning and tweaking much easier with the choice on what to clean. What's attractive in Weeny is its highly customizable nature. You can decide what to clean and this can be tweaked from the Settings option. For instance, clicking on Settings in the Clean Windows System tab will pop up a new window, this has two internal windows one is dedicated to Windows like cleaning Temporary Files, Run History… the second window is for Applications which acts as plugins manager and lets the cleaning the tracks of a huge list of third-party applications such as Mass Download History Information, MS office 2007, Magic ISO Maker 4.6, Microsoft Media Player, Google Toolbar history and more. 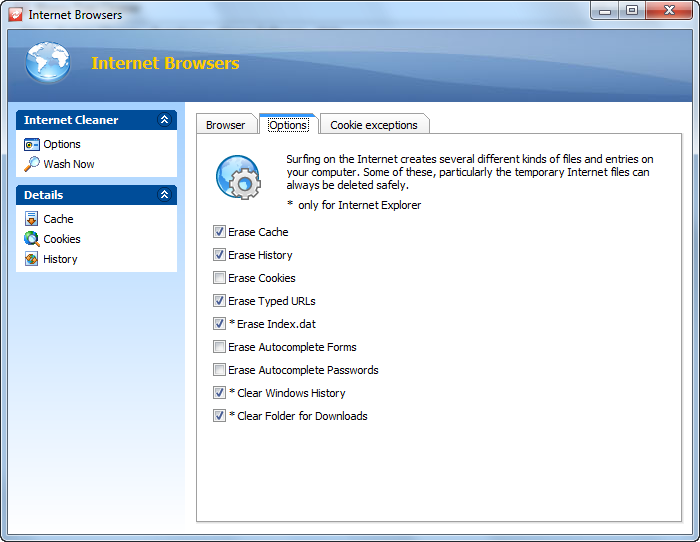 The Clean Internet Browsers tab takes care of IE and Firefox, plus includes cookies (for IE only) management tools such as to make exception which is important to not re-enter passwords in case logging to certain sites. Clean Windows Registry Section will do its purpose to clean and to optimize windows registry from broken obsolete keys and to give life back to windows registry. Weeny backs up everything before it starts cleaning, so if anything goes wrong, you can always restore your computer to a previous working state. Clean Disk Drives will let the user to choose which drive to clean and also to handle exception lists (Skip Files And Folders). Various extensions are supported in order to tweak the cleaning from .temp to .bak and more. There is a safe database but a user can include or exclude files or folders. In the option Settings it is possible to exclude system files or to include zero length empty files. Apart from cleaning, Weeny Free Cleaner also does Secure deletion (Standard, Military Standard, NSA Standard) of desired files/folders that as the author claims they cannot be recovered, and also there is Shortcuts Fixer section to fix broken or invalid shortcuts present in desktop, Start Menu and other locations. Weeny Free System Cleaner is a highly customizable cleaner that can be scheduled to run periodically. It works with Windows XP, Vista, and 7. It's not only customizable but also secure, because you can password protect Weeny Free System Cleaner thus denying others to use it, also its possible to launch the program on windows startup and to schedule cleaning at chosen period of time during the week. Weeny Free Cleaner is an all-round junk files cleaning software to get rid of Windows temporary files that most users are not even aware have been left behind, the software is composed of a Windows System Cleaner, Internet Browser Cleaner, Windows Registry Cleaner and Disk Drive Cleaner, each section is clearly marked and it has its own settings. A basic system tweaker, shortcut fixer and secure file deletion are also included, the secure deletion can wipe individual files and folders using a 3 overwrite pass and a labelled "NSA Standard" overwrites selected data with 7 passes. Internet browser history, cookies, index.dat and cache can all be deleted with a single click, if you want to save specific cookies from deletion they can be added to an exception list, but only Internet Explorer and Firefox are supported. The embedded Windows registry cleaner will get rid of obsolete Registry keys that clog up the computer slowing it down over the time. Weeny Free Cleaner erases Windows Prefetch files, log files, flash cookies, temporary files, Recycle Bin and a few other places, this cleaner can erase temporary files from non Windows applications, like Winrar, Adobe and ACDSee but it appears that this is mostly reduced to erasing the "Recent file list" leaving behind logs and temp files, clearly not enough for privacy. I found this Windows System cleaner to be adequate for a freeware, without any WOW factor, most paid for products beat it in features and have a more user friendly interface, Weeny Free Cleaner will do a good job for those requiring light cleaning once in a while and are not at risk of someone using undelete software to recover previously erased temporary files, its best feature is probably the secure file and folder overwriting. 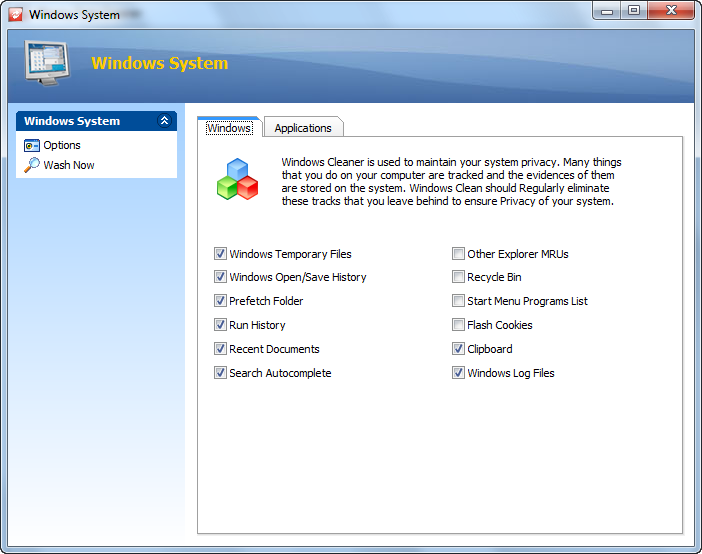 Weeny Free Cleaner is a free PC cleaner which cleans your windows system, boosts its performance and services the registry. For those who may not know, using a windows system over a period of time depletes its performance. The most common causes of depleted performance include corrupt registry entries, temporary files and system caches. Weeny Free Cleaner allows you to clean your registry, clear your temporary folder, delete disk and browser history, clear browser cache and cookies. Getting rid of your computer's history can prove quite challenging but Weeny Free Cleaner manages to do this in a very simple manner. The Windows registry is often fragmented, contains corrupt registry entries and broken program shortcuts. The registry cleaner allows you perform a set of vital operation to restore your registry to optimum performance. At the click of a mouse, you can clean, repair and delete registry entries. A backup and defragmenting facility is also part of the software unique features. The disk cleaner utility scans your disk for rarely used files-junk files as the software calls them and offers you the option of permanently deleting them. Many people are not aware that any file you delete whether permanently or to the recycle bin can be recovered from disk given that they are not overwritten. The file delete utility offers you the convenience of safely deleting files in such a manner that they cannot be recovered. The system tweak feature on Weeny Free Cleaner allows you to play around with various settings that would not be accessible through windows control panel. I was able to customize several aspects of my windows interface. You can do way with the boring white window background and replace it with a more fancier one, add more desktop icons, tweak the taskbar to your liking and go as far as disabling basic windows command like Run and Search. The shortcut fixer comes in handy when trying to fix broken system or program shortcuts. It automatically searches for broken shortcuts on selected drives and fixes them. For your own safety, steer clear of the System tweaking which involve memory management and optimization- you may end up causing a blue screen rather than avoiding it. I found this PC cleaner software quite easy to use but it does not clearly warn users on the effects of performing various operations like clearing windows temp folder or clearing cookies and cache. The interface is quite simple and well arranged but cannot be viewed in full screen mode or resized. The various features can be accessed by clicking on their respective menu buttons. The buttons at the top of the interface open new windows except for the System Cleaner button. The program shows a bit of hesitation while opening the new interface but I doubt if that will worry many users. To use the system cleaner, you have to click on the circles buttons or their corresponding blue rectangular buttons which change their colour to orange when focused. To select any of the processes, make sure that the circular buttons of the respective commands are ticked and are blue in colour. Once you have chosen at least one option click the Clean now button to proceed with the clean up. Weeny Free Cleaner is a superb light weight alternative to more heavier system utility software like Tune Up utilities. Weeny Free System Cleaner - impressively powerful, feature-rich and easy-to-use freeware application that enables you to quickly clean your system, clean your registry, clean application tracks and left-overs, repair registry, wipe files and folders, tweak various system settings, and more. A truly handy application, highly-recommended. "Weeny Free Cleaner is an easy-to-use cleaning and tweaking utility which includes all the important tools required to keep your system clean and secure."